Welcome to the dh furniture makers website. I make a wide range of furniture, wooden clockcases and bespoke joinery pieces. I am a versatile craftsman and undertake all types of work for the individual customer and organisations. carved signs; notice boards; garden benches; doors; lecterns to furniture of all descriptions; kitchens and a four poster bed with hand carved posts. I also enjoy making a variety of wooden clockcases and a selection can be seen on the clockcase gallery page. For the commissioned pieces of furniture I like to make a home visit to get a feel for the project by familiarising myself with the surroundings. I work with the client listening to their instructions and requirements in order to provide a free detailed quote with scaled drawings if necessary. If the client has made their own drawings or sketches I am only too happy to work from this and can provide a scaled drawing of their design. I make the item as described and if this needs 'fitting' I will also give a quote for this to be done. The choice of wood and finish is also decided upon before work commences. I source the wood from the highest quality local suppliers and I have also used reclaimed woods provided by the client. 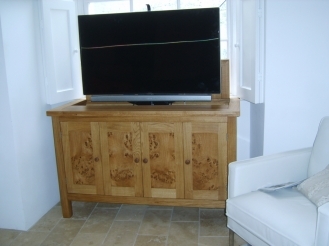 This superb cabinet is made from solid oak and has a remote controlled lift installed.This means that you can raise or lower the TV from the comfort of your chair. I mainly like to work with oak; ash; elm and pine but you will see I also use other woods as shown in the photo gallery. The furniture is finished to the highest standard in oil or wax. 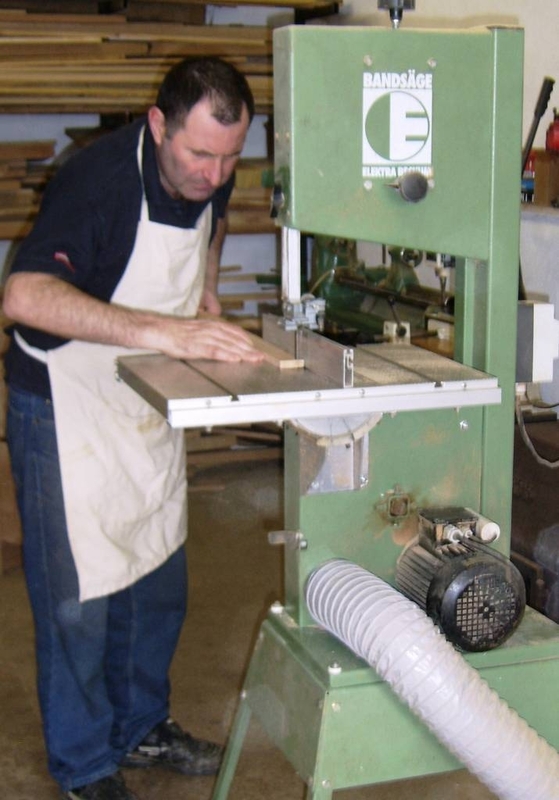 I studied my craft at St Loyes College, Exeter, and in 1998 achieved a diploma in Furniture Making and Joinery. Prior to this I had worked on my parents farm and when they retired I worked away on the roads as a fencing erector. After many years of hard work and travelling around the country I was advised, for medical reasons, to change my employment and retrain. I have always enjoyed working with wood and so this change in direction has been quite fortunate as I am now lucky enough to be working from home as a furniture/cabinet maker. Heales Cottage, Burrington, Umberleigh, North Devon. EX37 9LY.